Minecraft began as the combination of two simple ideas. The first is that players can harvest resources from the map in which they find themselves. Some of these resources, like food and wood, are common above ground. Others, like gold and stone, require a bit of virtual elbow-grease. This is where the “mine” (in Minecraft) comes from. 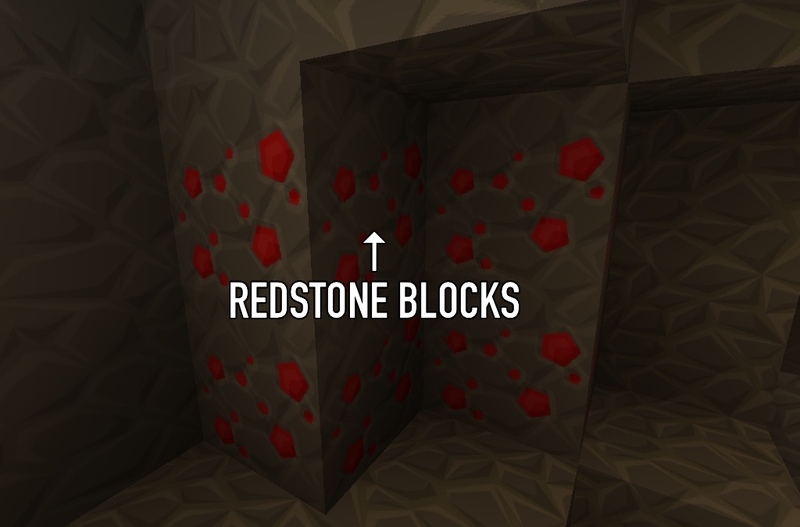 One of these resources is called Redstone. It’s found deep underground, and it’s a conductor of sorts. When harvested and placed on the ground, it resembles the silvery lines on the flip side of circuit boards. There are also power emitters, similar to batteries or mains power, which take many forms in the game. Using these harvested resources, players can build dwellings, cook food and even wire up virtual circuitry. This is where the “craft” comes from. Command blocks are placeholders which can contain a single server command. Server commands are anything you as a player can do (provided you are a server admin or in single-player mode). They’re like Amazon Dash buttons, in that they can be given a single command to run, at the push of a button. You can find your current map coordinates with fn + alt + F3 (for Mac) and F3 (for Windows). Walk to the block where you’ll place the door, and enter those coordinates in the command. Different Minecraft blocks (whether crafted or naturally occurring) have unique block names. wooden_door is the unique block name for an Oak door. 3 is a reference to the orientation of the door, so it might be different in your maps if you place your door in a different orientation. If so, try 0 through 3 until you get the desired result. We’ll make the second Command block whisper a message back to us to indicate when the test has found a matching block. When we flick the switch, and the door is still closed, we should see nothing. But when we open the door (and the test matches the open door’s orientation), we should see confirmation of this! Now we have a way to check for an open door. We don’t want to be standing around, to manually run this check though. Let’s set up the programming equivalent of an infinite loop, or the electronic equivalent of a crystal clock. Notice I’ve attached a button to each Command block, so that I can run their commands. These buttons also act as a power source, giving a brief power spike to the blocks they’re connected to. Map coordinates can also be relatively defined. That is, if you need to reference coordinates nearby the Command block, you can use ~-1 ~ ~+1 to mean the Command block’s x coordinate minus 1, the same y coordinate, and it’s z coordinate plus 1. 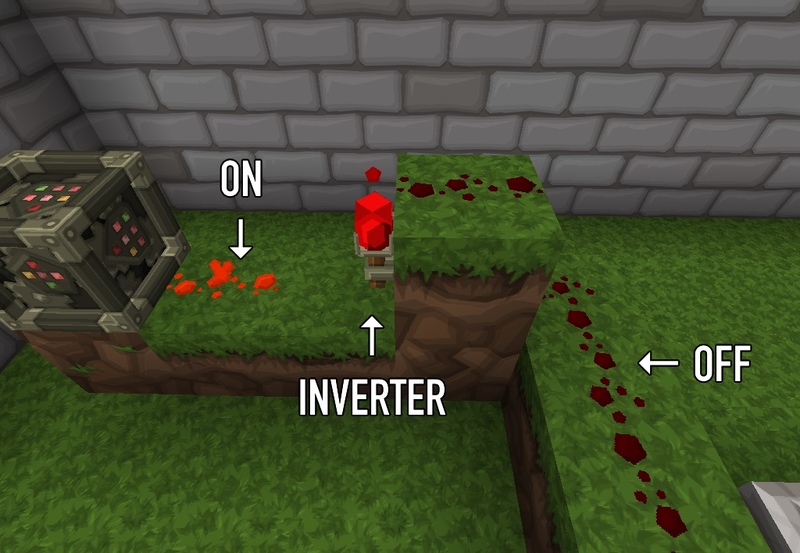 Redstone blocks also act as a power source. This arrangement has an interesting side-effect. 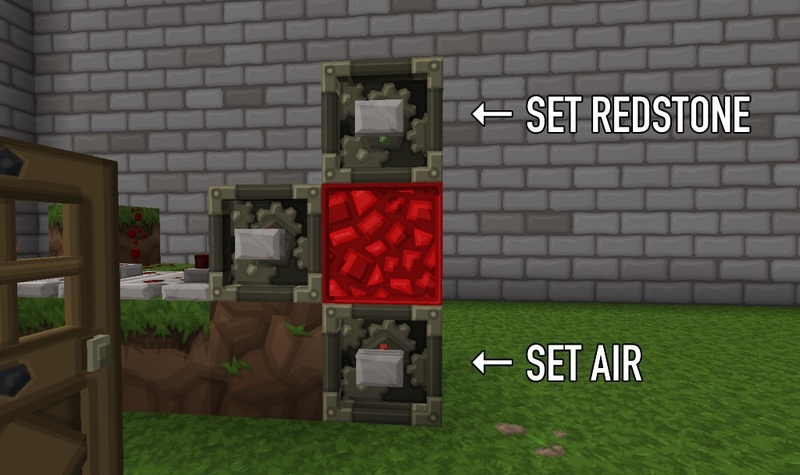 When the top block places a Redstone block below itself, the Redstone block gives power first to the bottom Command block. It then gives power to the top Command block. In the meantime the bottom Command block has removed the Redstone block. 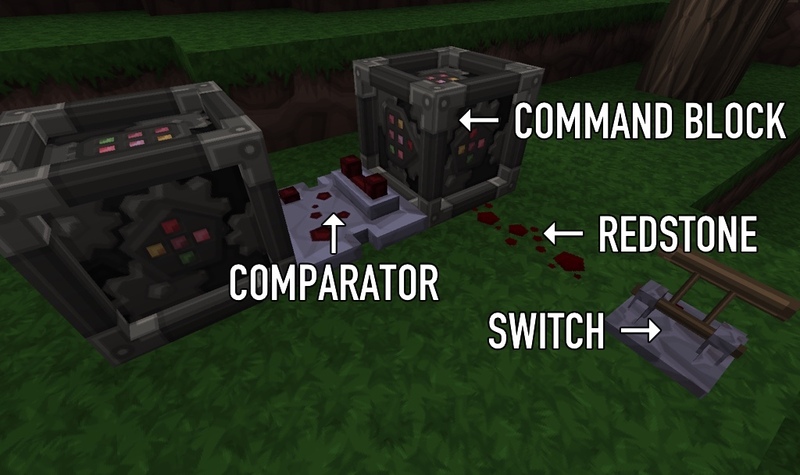 Since the top Command block got a new power signal (from the Redstone block it placed) and the block was then removed by the bottom Command block, it starts the cycle over again. This leads to the infinite loop I spoke about. The loop will persist through server restarts, and if you’re in creative mode you’ll be able to break the Redstone block and see new ones created instantly. By default, these Command block actions will be logged and will trigger messages on the server. You can disable these with a couple commands (which you only have to enter once per map): /gamerule logAdminCommands false and /gamerule commandBlockOutput false. If we take power from the clock, and direct it into the testing Command block, the test will run many times a second, giving immediate feedback when the door is opened! All of this is pretty and useless without the ability to see these changes in PHP. We need a way to “hear” when the door has been opened, and react in PHP. The path to Application Support will be different for you – it’s usually in the Library folder associated with your account. You could also be using a portable version of Minecraft, so you’ll just have to search around a bit, until you find the logs folder. This Finder instance narrows the file watch list to *.log files in the same directory as the one we’ve specified. The methods are clearly named, so you can expand the criteria for other applications. This script acts as a long-running process. That is, we want to watch for changes to files, for an indeterminate amount of time. So we create an infinite loop, and use it to constantly probe for file changes. New chat messages are appended to the bottom of the log file, so we need to check if any log files have been modified (we expect only one log file), split the log file into lines and check each line from the bottom of the file to the top. If we see a log line containing CHAT, we can assume it is a chat message. If it also contains open or closed, we can assume it is caused by the circuit we created. You’re welcome to use more “unique” message formats for open/close events. The approach I’ve chosen is simple but open to abuse and ambiguity (like if someone else whispers “open” to me). The underlying principles are the same though. This is only half of the experiment. In the followup post we’ll look at how to build an Arduino-based alarm circuit, and connect it to this script. 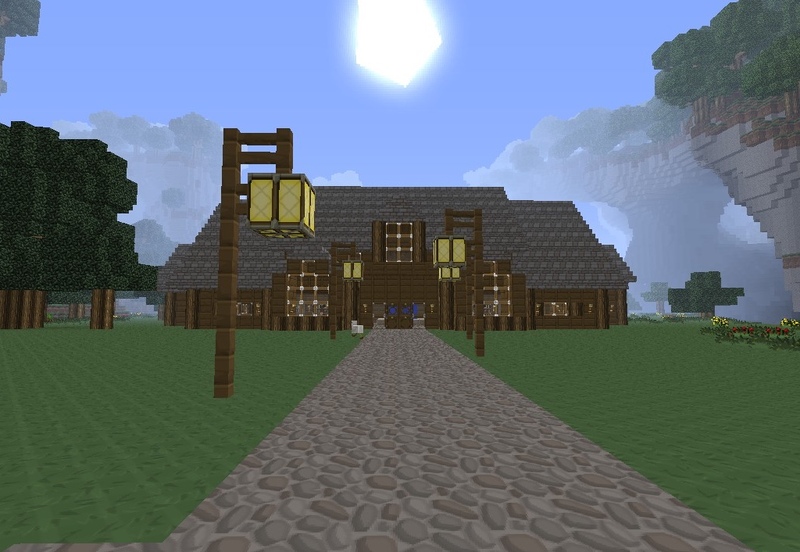 The end result will be an automated, real-world alarm for our Minecraft mansion. If you’ve enjoyed this and/or have questions, please let us know in the comments!